A new study suggests that having the right kind of asteroid belt in a solar system could be essential to finding intelligent life in the universe – including here on Earth. A team from NASA and the UK's Royal Astronomical Society has been studying the role of asteroid belts in the evolution of life on Earth and in the wider universe. They concluded that an asteroid belt is important in the development of life, since its material seeds worlds with lots of useful stuff, even if the delivery system leaves a lot to be desired. "Asteroids are thought to be a primary mechanism for distributing water and heavy metals across the Earth's surface, and possibly even the building blocks of life itself," Rebecca Martin, a NASA Sagan Fellow from the University of Colorado told The Register. "In our own history, if an impact hadn't killed off the dinosaurs, then mammals might not have evolved into intelligent life." As solar systems form, they frequently acquire an asteroid belt around the "snow line" – the point where it's cold enough for volatile materials such as water to remain solid. But just having an asteroid belt isn't enough in itself; you need a large planet around to make sure the belt isn't too thick or too thin. In our own solar system, Martin explained, Jupiter sits on the edge of the belt, and its gravitational force dissipates the asteroid belt by sending much of the material there either spinning out into space or down into the Sun, with a small amount colliding with the gas giant itself and adding to its mass. 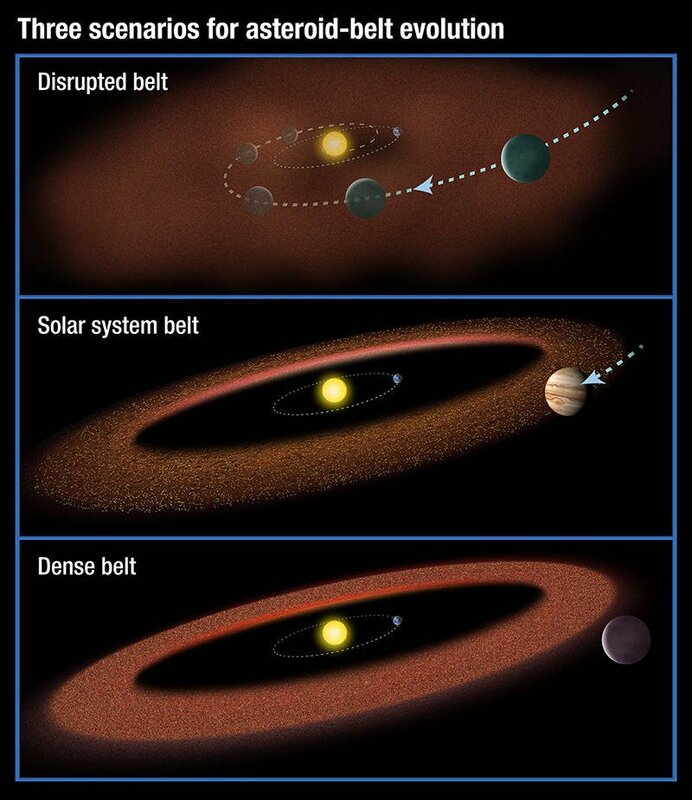 Some gas giants, typically those formed early in the life of the solar system, don't have a stable orbit and spiral in towards their sun, scattering the asteroid belt completely. But if the planet is too far from an asteroid belt, then it has no effect and the belt remains packed with material that bombards other planets too frequently for them to recover. "Jupiter's really stable," Martin said, "it hasn't moved much more than 0.2 astronomical units (one AU = 92,955,807 miles) since it was formed. During its life 99 per cent of our asteroid belt has been scattered, thanks to its gravity." The team then examined other solar systems to find out if similar conditions could be found elsewhere. Of the 520 giant planets studied, only 19 of them were outside the snow line, and only four per cent have the kind of compact asteroid belt found in our own locale.